When Benco Dental purchased their new property, as far a signage was concerned, there was not much to be excited about. Just an older Monument Sign and a couple of bar walls. 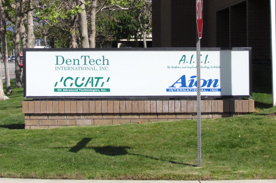 However, recognizing the potential of what two beautiful Channel Letter Signs and a new Monument Sign could do for the business, Benco Dental decided to take advantage of the street visibility of their property, get more exposure for their business and stand out from their competitors with practical, creative signage. 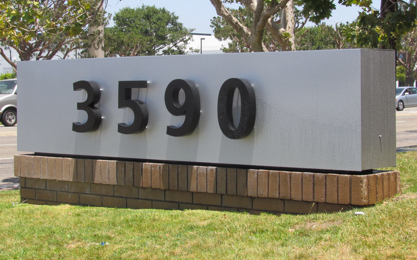 When they turned to us for their sign needs, Landmark Signs was happy to help. Decsription: Black acrylic channel lettering with halo lighting on a brushed aluminum background. As you can see from our before and after photos, the Monument Sign that was originally on the property had been there for a while and was in need of a new look. 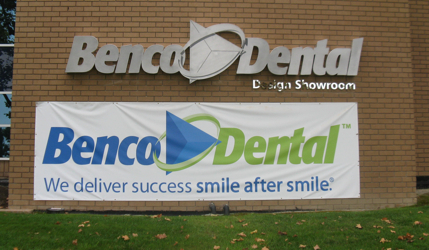 Our design team decided that simple and classic would best reflect the Benco Dental company. And because the Monument Sign was located right next to the Channel Letter Sign proudly displaying the company’s name, we agreed that in this case less was more, and only wanted the address on the sign. Description: Aluminum lit through channel letters with white internally lit neon. 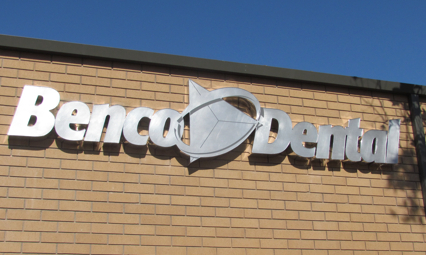 For their Channel Letter Signs, Benco Dental had an idea in mind for a set that would look as if the light was coming through the Channel Letters. They had seen it done before, but didn’t want to spend the higher amount it would cost to get that sort of a look. So, our design team was able to recreate the look for a lower cost, and we were very happy with the result. While matching the more subtle, classic approach of the Monument Sign, it is unique enough to stand out and get their business noticed for all the right reasons. The Benco Dental Showroom project was one of those projects that our company enjoys doing because we were able to rise to the challenge of completing a multiple signage job and were able to get a little creative, something our design team thrives upon. Don’t forget to connect with on our social media sites. Through them you can stay up to date with our company, gain insights into the sign industry and discover what sign opportunities await you and your company.